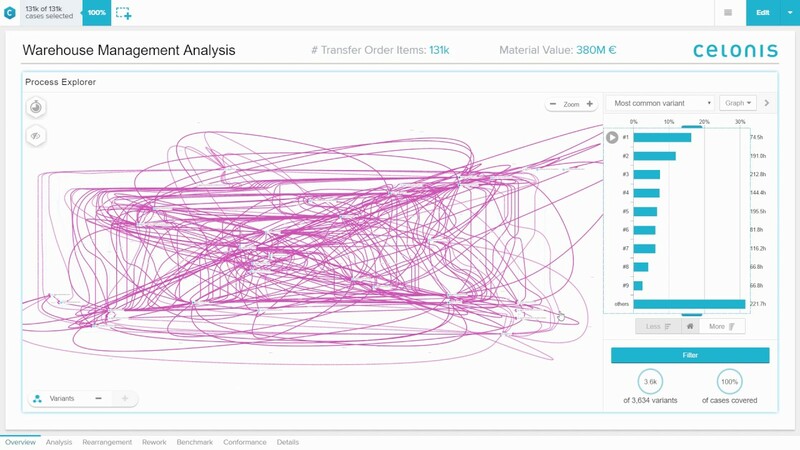 Visualize how your procurement process really flows–starting from the creation of a purchase order through the goods receipt and ultimately the payment of the invoice. Uncover root causes to inefficiencies. Identify manual steps and re-work that extend the cycle time. See what causes specific suppliers, products or divisions to delay shipments. Lastly, act on your insights. Automate manual steps, reduce maverick buying and empower procurement associates with real-time alerts to avert late deliveries or re-worked invoices. Create an intelligent procurement process! The central processing of incoming invoices (accounts payable) is a high-volume digital process, which runs through many different IT systems and which involves almost all departments in an organization. 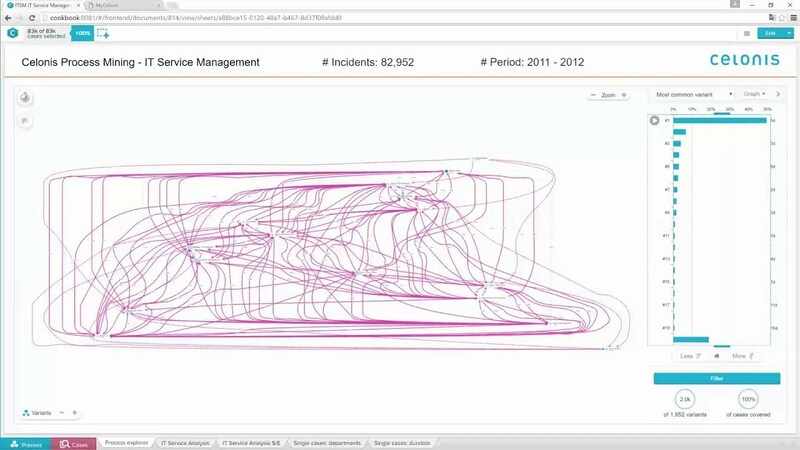 Visualize each detailed step (and all the variations) in the process and discover the root causes to operational inefficiencies. What causes so many invoices to be canceled or what up-stream actions would prevent re-worked invoices? Set alerts in the procurement process to help you consolidate payments and maximize cash discounts or enable AP associates to pay exactly on time, and maximize working capital while avoiding late payments. Run an intelligent AP process! 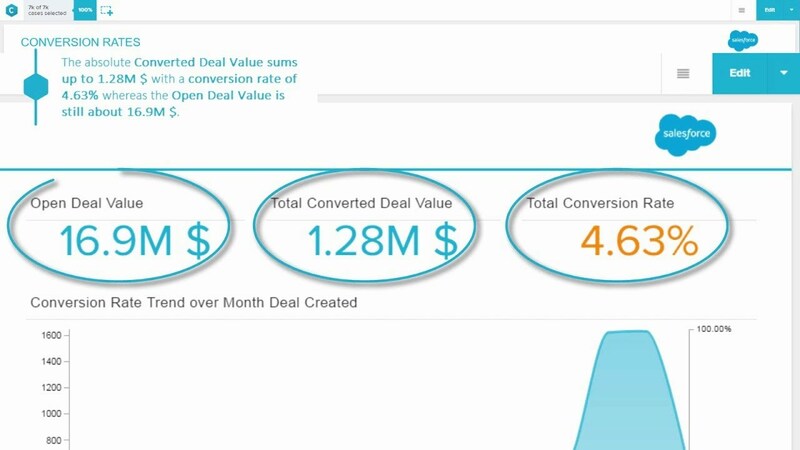 Discover the break points in your revenue realization process–from order entry all the way through the delivery of goods and receipt of payment. 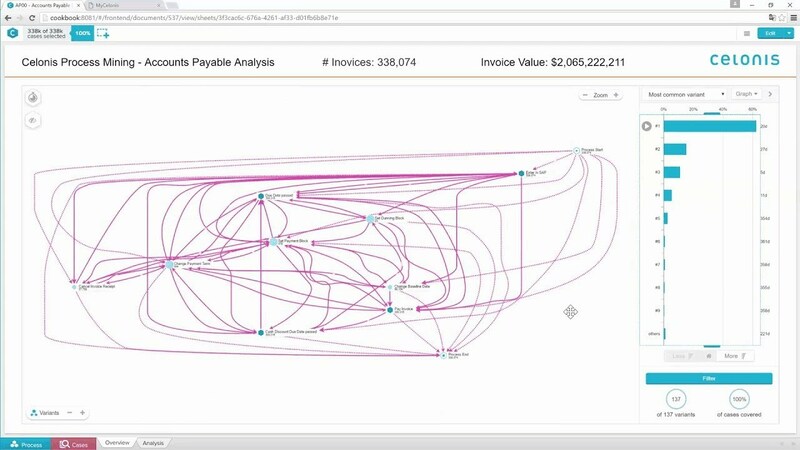 Visualize the steps between delivery and invoicing that cause long throughput times. Understand which order blocks are hurting your monthly recognized revenue. Put in place specific actions and alerts to avert long-running holds or order cancellations. Know the specific manual steps to automate, to instantly increase on-time delivery. 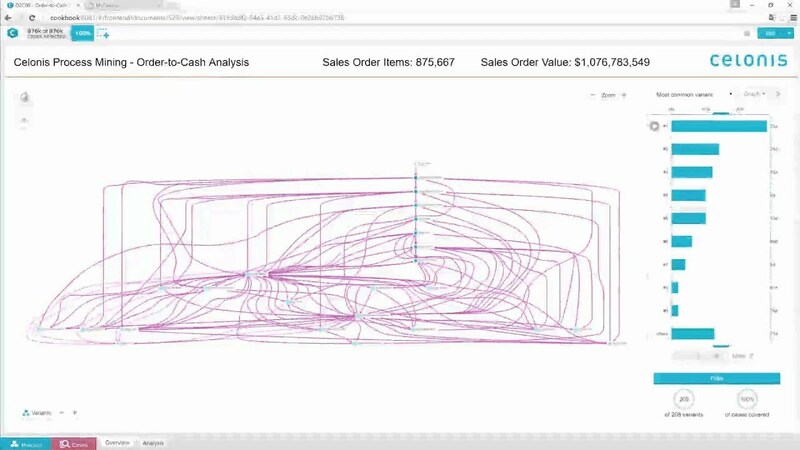 Realize an intelligent order-to-cash process! The central processing of collecting payment (accounts receivable) is a high-volume digital process that can span different IT systems and cross departmental boundaries. Understand all the permutations of your receivables process–from invoice generation to receipt of payment. See and prioritize which upstream discrepancies cause payment delays. Empower AR associates with alerts and actions to encourage on-time payments and reduce downstream impact to operations. Run an intelligent AR Process! 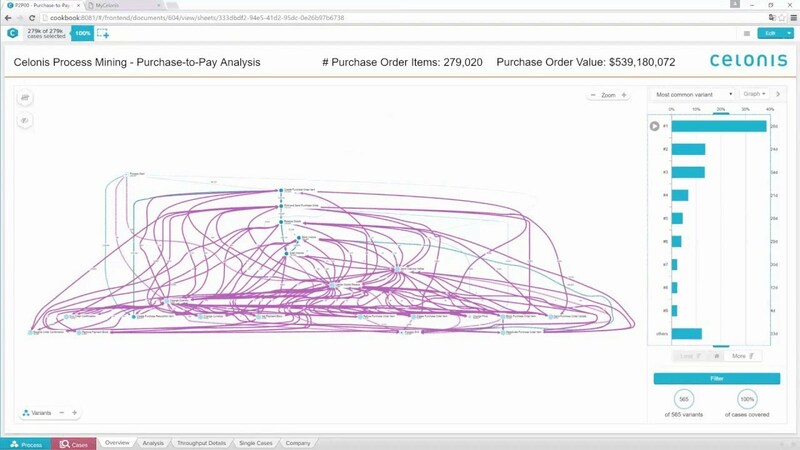 Visualize how your logistics and supply chain operate in reality–from order entry all the way through delivery. Understand inefficiencies in your distribution network. Discover the root causes for specific delays and prioritize the issues that reduce revenue or delivery the most. Help order processing associates become more efficient by identifying upstream steps that create downstream re-work. Create actions and alerts to avert late deliveries to high-value customers. Create an intelligent supply chain process! Gain complete transparency into every operation in your warehouse, from initial picking to confirmed delivery. Understand root causes in re-worked picking items. Prioritize where master data errors cause issues in delivery confirmations. Create actions and alerts to ensure warehouse associates prioritize the orders for the most important customers and ensure on-time delivery. Run an intelligent warehouse management process! 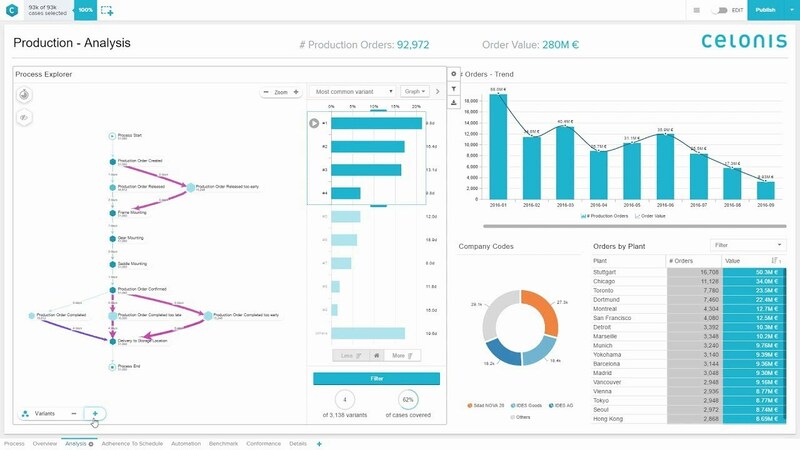 Gain instant transparency into manufacturing process inefficiencies, from the entry of the production order all the way through the quality inspection, warehousing and delivery. Determine which contracts were produced before or after the desired date, why and the downstream business impact. Discover the highest-value manual steps to automate and quantify the direct savings. Reduce re-work by creating in-process alerts and actions that highlight potential quality issues prior to testing. Realize an intelligent production process! Discover how your IT service process is operating and how it can be made more efficient and deliver higher first-time resolution. Uncover the root causes to delays in long running tickets. Prioritize and manual steps to automate that can have the greatest impact on resolution times. Pinpoint cross-departmental bottlenecks or ticket ping-ponging and implement proactive alerts to remove those inefficiencies. Create an intelligent ITSM process! Increase conversion rates and reduce sales cycle times. Get visibility into the actual journey of your leads and implement alerts and actions to reduce sales cycles and increase lead-to-close conversion rates. Understand which upstream touchpoints are characteristic of hot leads and implement alerts to deliver them earlier, at a higher priority. Know which steps in the sales process to automate and which steps need professional sales intervention. Create an intelligent lead-to-order process. Managing master data workflows is a core capability of many businesses, but blindly deploying master data projects can be a high-cost endeavor across a broad landscape. A best practice is to use Celonis to discover the specific master data issues that are directly impacting key business metrics like revenue, on-time delivery, working capital, cash discounts, etc. Understand the process steps where master data is critical and prioritize your master data efforts based on the business outcome. Implement up-stream alerts in processes that identify possible MDM issues, and avert downstream delays to shipments, receipts or production. Run a business-impact-focused, intelligent master data workflow! Gain instant clarity into the complex processes and various IT-based activities that make up the meter-to-cash process from the initial reading to final payment receipt. Understand the true reality of the various permutations of the process, and discover the bottlenecks that cause the largest delays in payment receipt and biggest internal manual effort. Instantly identify what steps create compliance issues, and eliminate them with up-stream alerts. See a value-based priority of manual steps so that automation will directly impact on-time payments. Run an intelligent meter-to-cash process! Claims handling is the critical process in insurance that can impact customer experience, yet it is rife with inefficiencies and unrealized opportunities to build customer loyalty. Use Celonis to get instant transparency into every permutation of the claims handling process and discover the inefficiencies that create the longest delays and most costly errors. Understand and prioritize the steps that can be automated to reduce cycle times and improve productivity. Create AI-based alerts and actions in up-stream processes to prevent manual claims errors. 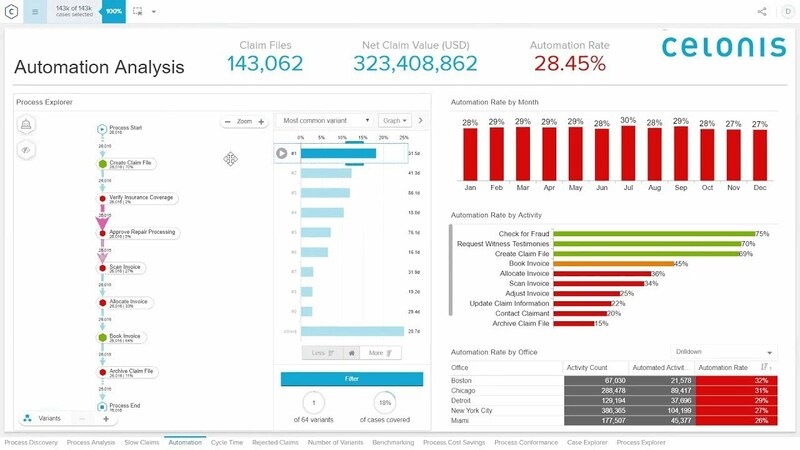 Transform into an intelligent claims handler! The Intelligent Business Cloud uses process mining technology to provide the transparency you need for an objective understanding of the inner workings of your business processes, and thus the foundation for driving strategic transformation initiatives. Building on this foundation, the Intelligent Business Cloud provides the detailed process analysis to know what to change, and the value each change will deliver. Finally, the Intelligent Business Cloud provides prescriptive actions for each step in the process, ensuring each process flow maximizes the desired outcome. This technology is valuable for improving any business process, but often there is an opportunity to improve a range of processes through a strategic transformation initiative. It is essential to Business Process Outsourcing success to understand the true as-is process, and all variation in that process prior to attempting to outsource it. 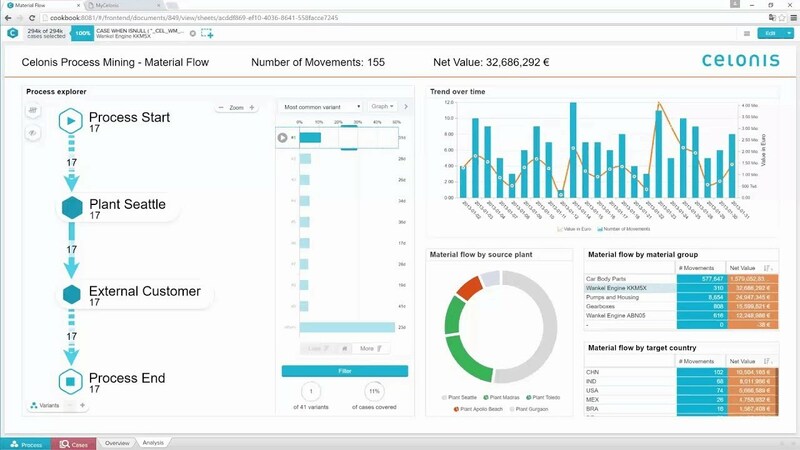 The process mining technology built into the Intelligent Business Cloud uniquely provides full visibility into your true process. In addition, you can understand the costs and value of your process so you can build the business case for your business process outsourcing initiative. Finally, after outsourcing a business process, the Intelligent Business Cloud can monitor success, and document the process cost savings associated with the initiative. Understand and standardize your process prior to outsourcing. Know which processes are the best fit for BPO and exactly which metrics you should use to meter the BPO costs. With detailed analytics, build a powerful business case to show the specific cost and time savings from outsourcing the process with clear SLAs to ensure financial success. Monitor success metrics in detail; know exactly why deviations from SLAs occur. Compare one BPO firm to another with objective metrics to make selection decisions. Your enterprise resource planning (ERP) system is the backbone of your business, and any efforts to modify it bring understandable concern. Success depends on a profound knowledge of your processes and user behavior. Think of the Intelligent Business Cloud as the roadmap for your core operations, helping you identify exactly how and why things should run, before you take any steps toward change. Highlight differences and system gaps to identify items to resolve. Benchmark to identify best practices and design the optimal blueprint for rollout. Monitor to ensure ROI and proactively address ongoing improvement opportunities. Operational system complexity is the greatest challenge facing companies looking to harmonize or migrate ERPs. The Intelligent Business Cloud provides a view into that complexity as well as a way to untangle it and plan for the future. A complete view of all processes helps you understand how your operational systems really work. With transparency you can determine the exact “to-be” process state. Monitor the new ERP system’s processes against a benchmark, and measure the conformance to the desired process to report on the success of the ERP migration. Every organization strives to execute its business strategy more consistently and reliably than the competition. Companies achieving operational excellence have relatively lower risk, lower costs and increased revenue. The fact-based insights you gain through the Intelligent Business Cloud help you audit, analyze and improve existing business processes by answering both compliance- and performance-related questions. Identify areas of high and low performance, along with root causes and the immediate impact of changes being made. Lower risk by proactively addressing potential areas for improvement before they become problems. Track and monitor continuously for sustainable operational excellence results. 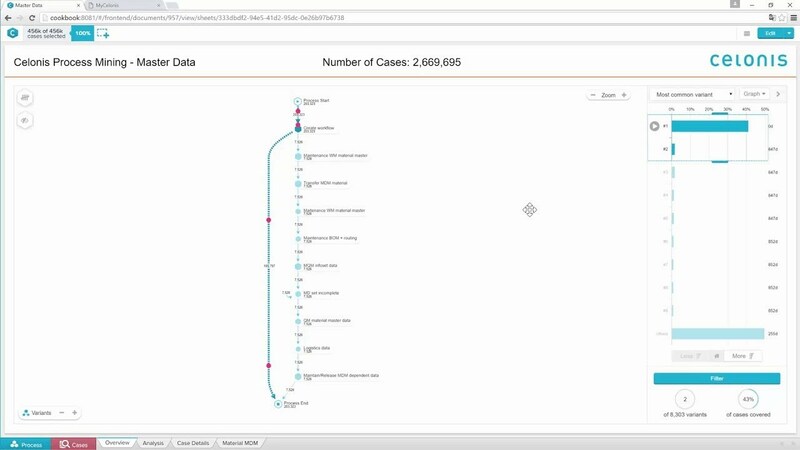 Process mining maps and visualizes processes based on your data. See steps as they occur, from start to finish, for maximum transparency and oversight over your value chain. Find the most efficient process paths using process mining technology. It uncovers all vulnerabilities and deviations from the intended process flow and why they’re happening. Vergleichen Sie Ihre leistungsstärksten Prozesse mit anderen Prozessen und sehen Sie, wie Sie Best Practices abteilungsübergreifend anwenden. In this age of competition to do more and do it faster, digital is the reigning solution. Many companies are looking to automate, but either jump in before they’re ready or stall trying to find out where to start. Not only can the Intelligent Business Cloud help build a fact-based argument for task automation initiatives like robotic process automation (RPA), it can show the true potential of automation for savings and ongoing ROI. Identify process areas that could be improved with task automation. Benchmark digital workers to ensure you’re maximizing automation potential. Monitor automation and RPA projects continuously to verify expected performance and additional opportunities. For every dollar you invest in an RPA tool, you’ll spend another ten for consulting. Start with process mining to prioritize automation tasks and spend less on consulting. Implementing RPA robots can involve multiple iterations. With a clear view on how your processes work, you can train your robots faster. Automating a flawed process will only propagate past mistakes. Full process transparency reveals your best opportunities, and identifies risks to avoid. Process complexity is a major driver of process costs. Unfortunately, SSOs often inherit complex processes with high transaction volumes and are tasked with standardization. Process mining technology, within the Intelligent Business Cloud, can uncover hindrances as well as opportunities to simplify processes, save costs and speed up performance. Achieve significant savings and efficiency through standardization. Reduce process complexities and costs and increase speed. Continuously monitor global process conformance and efficiency. Scan your SSO-supported processes to get full transparency into your as-is processes. Prioritize your standardization efforts according to business value and level of complexity. Continuously monitor the conformance of your processes to maintain standardization and allow logical deviations. The thought of an audit may make non-auditors cringe, but it’s a good way to ensure the performance and compliance of your financial operations and, therefore, your company’s fiscal health. 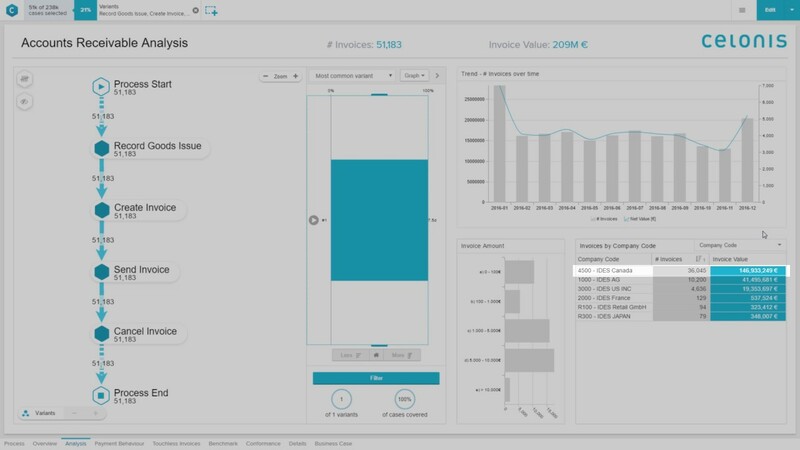 The Intelligent Business Cloud helps analyze approvals, timelines, exceptions and violations–like duplicate payments or maverick buying–in order to improve processes and avoid business risks. Uncover hidden inefficiencies and bottlenecks to reduce auditing and everyday costs. Conduct real-time surveillance of transactions and use root-cause analysis to proactively drive improvements. Enable high precision, consistency and compliance across all company processes. Benchmarking process execution between different parts of the organization will help to set the right focuses during the audit planning phase. Pre-defined analyses help with standardization and increase objectivity with fact-based process transparency that can be shared with the auditee. Gain full transparency into improvements triggered through an audit to ensure ongoing effectiveness and compliance. Does it work with my IT landscape? 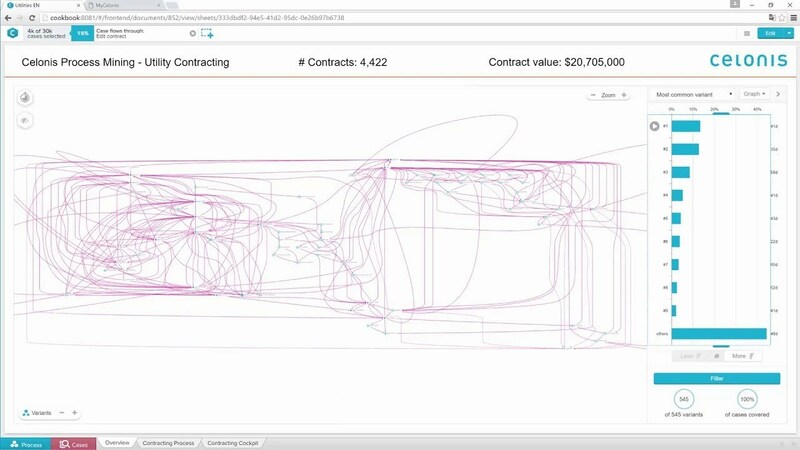 Is process mining useful for my company? Is the Intelligent Business Cloud right for your initiative? The use cases outlined above are just the beginning. Are you wondering if the Intelligent Business Cloud can help your business transform? Contact us to discuss your specific needs and together we can formulate a plan for success.